Welcome to Not Just Knots! You've chosen a challenging project that is as much fun as it is practical. The resources below are meant for Ohio 4-H members and others who are using the Not Just Knots project book. Sample pages of the book are available on Ohio 4-H Project Central, and the book itself can be purchased directly from the Ohio State University Extension eStore or from local county Extension offices, where Ohio 4-H club advisors, club members, and other Ohio residents get the best price. Other state 4-H offices can benefit from our Partner Pricing program. In addition to the capstone project guidelines in Activity 17 of Not Just Knots, the ideas below are intended to help you decide how best to show and apply what you have learned about knots this year. If this is your first year in the project, a knot board that shows your work on the knots featured in the book is a great start. Don't forget! Your capstone project needs a plan with (A) a project description, (B) materials list, (C) steps to completion, and (D) timeline. See Activity 17 in the project book for more infomation. Use the half hitch, a simple and versatile knot, to create a grip anywhere you need a more secure hold on something. Examples include a lawn mower steeing wheel, tool handles, farm equipment, gates, and hiking staffs. Directions for a rope halter from the American Quarter Horse Association are below. Use them to make a halter for your horse or adapt them as necessary to make a halter for a different livestock or companion animal. Teach someone or a group how to make any knot by providing step-by-step instructions on a temporary knot board (instructions below). Learn more about macrame and use it to make a wall hanging, plant hanger, belt, earrings, or some other decoration or accessory. The overhand knot is the simplest and smallest of all knot forms. It can be used in combination with other basic knots to make more knots with different names and functions. Learn all about the overhand knot and its many uses, and then create a knotboard showing and identifying some of the knot combinations. Whipping is used to keep cordage ends from unwrapping or fraying, and there are many ways to do it. Explore a few of them and create a knotboard that demonstrates the steps for at least one method. Learn about West Country Whipping, a practical and easy wasy to finish the end of a piece of cordage, and use it to finish a few different kinds of cordage. Make a knot board showcasing your work. Design and create a bracelet based on the Turk's head knot. A figure eight knot is an excellent stop knot because it is easy to tie and is bulkier than an overhand knot. Adding a slip knot through the center of the knot produces the "figure eight slip knot." Using figure eight knots and figure eight slip knots with other basic knots makes even more knots with different names and functions. Make a knot board showing and identifying some of these knot combinations. The bowline knot has many variations. Learn about some of them and create a knotboard that features the basic knot and a few related ones. Make a video that explains some aspect of knot tying, features your work, or showcases a location that has to do with knots. If possible, make it available to others on YouTube. Need more ideas? You will find many more in knot, macrame, and craft books and on many websites. 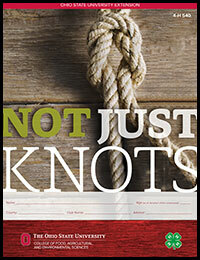 Don't forget to check morethanknots.com, the website of our author. To suggest a capstone project or even write your own, please contact Jane Wright. More information about writing your own is included in Writing a Capstone Project for Not Just Knots. Many thanks to project book authors and 4-H volunteers Glenn Dickey and John Dickey, and to Glenn Dickey for permission to feature content from the website morethanknots.com.